MSNBC’s Lawrence O’Donnell is about to get his walking papers from the top brass at the rapidly failing cable news channel. 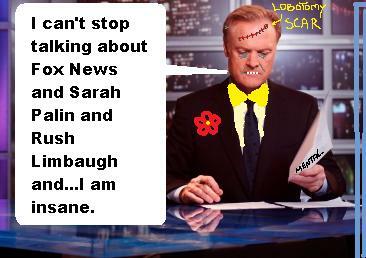 Pushing O’Donnell out is a mercy killing as far as MSNB is concerned, because rumors have spread that O’Donnell, who recently tried to get ratings by tweeting in advance that he was going to go after Rush Limbaugh’s weight, is rumored to be again going off the deep end. It’s not the first time he’s taken a dip in the nuthouse pool. Joe Scarborough had to gently edge O’Donnell off the air when it became apparent several times that O’Donnell was a mental case — or at least behaving like one. According to reliable sources, Lawrence, a fourth-string actor, is now about to be a failed TV pundit — although it should be mentioned that he has failed many times before. O’Donnell is a sorta-kinda actor, but he has only managed to land the kinds of roles that struggling actors often get after they’ve been around long enough and casting directors have gotten so used to their faces that they start to feel sorry for them. O’Donnell has never done any acting work that is worthy of merit…he’s kind of a failure in the acting world — but that seems to be the story of his life. He likes to throw around his Harvard credentials but he went to Harvard College — not “the” Harvard University. Still, it’s not a lie when he says, “I went to Harvard.” That’s a major fail and it puts him in league with his fellow nut job Keith Olbermann who claims to have graduated from Cornell. Truth be told, Olbermann did indeed graduate from Cornell — but not from “the” Cornell. He graduated from the Cornell that teaches farming and animal husbandry. It’s easy to see a pattern of deception here — the trail of the third tier crazy people who went to sound-alike schools. O’Donnell pretty much didn’t fail as a TV writer, but for some reason he doesn’t do that anymore. Sources say that O’Donnell is a little out of his mind and since his not-so-bad gig on the TV hit “The West Wing” he doesn’t seem to be too much in demand. “It’s like everybody seems to want this guy for something but then after he’s been around a few years they can’t wait to get rid of him. He must be a lunatic,” said a source close to The Damien Zone. Maybe he’s listed as a writer because he helped real writers or something — who knows, right? O’Donnell — now 62 years old — is a TV news analyst, but he’s really only made it onto the left wing nuthouse shows that nobody watches — things like “The McLaughlin Group” – “The Al Franken Show” – and “Countdown with Keith Olbermann. Olbermann has already been demoted to non-existence, and it’s quite likely that having to two mental cases on the same show was a recipe for disaster. MSNBC’s after Prime Time presentation of “The Last Word With Lawrence O’Donnell” was pretty much doomed to failure since it was only pasted up on the screen to fill the void left behind when “The Ed Show” got canned early in 2013. O’Donnell, a native of Boston from Shanty-Irish lineage, has had his meltdowns and how he is not in a mental institution is anyone’s guess. He’s made racial remarks that he probably thought were helpful to black Americans — the famous “I’m Dancing as fast as I can” debacle, but that was an epic fail. The Damien Zone has inside information that O’Donnell is only being kept on the air at the current time because it’s the summer season and nobody watches anyway, and it’s going to be a slow year. According to our sources, O’Donnell will be booted by the end of November 2013 and Rachel Maddow will be shown the door by January 2014. Where will they go? What will MSNBC do from there? Well — we kind of know, but we’ll cover that in a later item which is scheduled for publication in September. This is the greatest website in the world. It makes my day! How can a guy like Lawrence O’Donnell have the nerve to talk about Rush? Now August 2017 and Lawrence and Rachel are still on the air. Terrible that they have to keep pounding the anti-Trump routine night after night. I know they rather be analyzing something else. I feel sad for them both. Rachel has that smirky laugh that tells you she’s not content. Lawrence just want to be on stage or on TV. Wasted his vocal talents doing both. Could have been a good baseball play-by-play announcer.